Attorneys representing ACLU-NH and news outlets suing to get the unredacted list of dishonest police officers prepare for court Oct. 19 in Hillsborough County Superior Court South in Nashua. 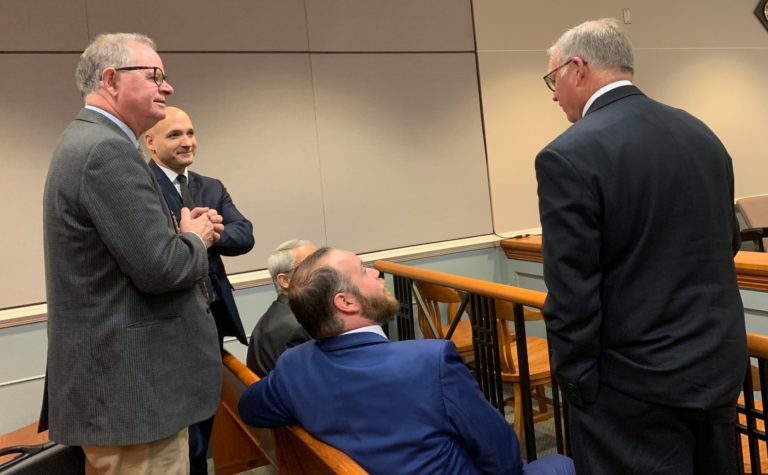 Standing from left are attorneys Jim Moir, the state’s leading expert on “Laurie” issues, Gilles Bissonnette and Gregory S. Sullivan. Seated are William Chapman and Henry R. Klementowicz. CONCORD – The Attorney General’s Office has added 81 new redacted names since June 1 to its secret list of law enforcement officers who have engaged in misconduct that calls into question their truthfulness, bringing the total now to 249. And it is likely the number will increase again when all of the police departments have been certified compliant with 2017 protocols to identify and track dishonest officers. The two biggest police departments – Nashua and Manchester – are among the 31 percent of police departments that are not in compliance, according to a list released by the Attorney General’s Office to ACLU-NH. The list of departments is here. 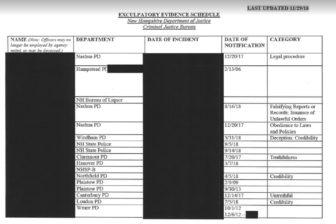 ACLU-NH, the New Hampshire Center for Public Interest Journalism and five newspapers are suing the attorney general to obtain the names of the listed dishonest officers, which is now called the Exculpatory Evidence Schedule. It was formerly called the Laurie List. Read lawsuit here. Screen shot of updated redacted EES list of dishonest officers. This shows 1 of 11 pages of names released Tuesday. See full list here. The names are redacted from the list, but most include the department where the individual works or formerly worked. Some include the dates when the names were added to the list and some briefly state the type of wrongdoing. The list includes “dishonesty” and “excessive force” and “criminal conduct” among a hodgepodge of others. See the latest list released Tuesday here and the June 1 list here. The attorney general argues the names are confidential by law because the list is an extension of an officer’s personnel file. ACLU-NH and the news outlets argue the names should be public to hold the government accountable and make sure prosecutors are disclosing the names of dishonest police to defendants as required by the U.S. Supreme Court case Brady v. Maryland. Criminal defendants are guaranteed all evidence in their favor, including the names of dishonest officers who would testify against them. Defendants could use that information to impeach an officer’s testimony. A conviction could be overturned if it is later discovered that evidence of a dishonest police officer in a case was withheld from the defendant. In egregious cases, the charges could be dropped altogether. The Attorney General’s Office filed a motion to dismiss the suit, which the news outlets and ACLU-NH opposed. “This Court must … order the EES List be produced because the List will inform the public of police officer misconduct and provide transparency that will help ensure that prosecutors have been (and are) complying with their obligations to produce exculpatory information to criminal defendants under Brady,” the objection states. The attorney general’s March 21, 2017 memorandum explains that such misconduct includes telling a deliberate lie during a court case, falsification of records or evidence, any criminal conduct, egregious dereliction of duty, and excessive use of force. The lawsuit was filed by the ACLU-NH, the New Hampshire Center for Public Interest Journalism, the Telegraph of Nashua, Union Leader Corporation, Newspapers of New England, Inc. (through its New Hampshire properties), Seacoast Newspapers, Inc., and Keene Publishing Corporation. Senior Assistant Attorney General Geoffrey W. Ward answered questions from Gilles Bissonnette, ACLU-NH’s legal director, in a letter dated Nov. 15, including the fact that 81 new names have been added. Ward said the state has received 10 requests from officers seeking to be removed from the list. Three names have been removed, three have been denied and four are currently under review, Ward wrote. The new certification process includes having a chief or designee review police personnel files to annually update the names of officers with sustained discipline for dishonesty or excessive force to be disclosed to the attorney general and the state’s 10 county attorneys. The deadline for compliance has been pushed back several times. The latest deadline for all departments that employ sworn law enforcement officers to be compliant is Jan. 1, 2019.